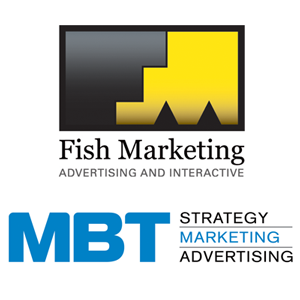 Two established Portland-based marketing firms, Fish Marketing, and MBT Marketing Communications, today announced the formation of a collaborative. Both firms remain separate companies with their own slate of accounts, and will occupy suites 620 and 635 in the Olympic Mills Commerce Center at 107 SE Washington. Fish and MBT have deep retail roots, and are about equal in billings, but earn revenue differently. Fish with a staff of ten, has a well-established digital marketing capability that contributes about 55% of revenues. The remaining revenue comes from brand strategy, traditional advertising and media. MBT employs ten, and is broadcast media oriented, with media contributing about 70% of its billings. The remainder of MBT’s billing comes from strategic planning, marketing and advertising services. In the past, both firms relied on independent firms for services outside their core expertise. Fish Marketing was founded in 2003 by Doug Fish. Fish, a 32-year veteran of Portland’s ad community, previously founded Fish Advertising and worked at Gard and Gerber Advertising. MBT, was founded in 2003 by former Fred Meyer Marketing Executives, Norm Myhr, Elwood Beukelman, and Scott Thompson. The lease arrangements were handled by Craig Reinhart of Cresa Partners, Portland. For more information contact Doug Fish, at (503) 972-8977 doug@fish-marketing.com or Scott Thompson at 503-232-7202 scott@mbtmarketing.com.